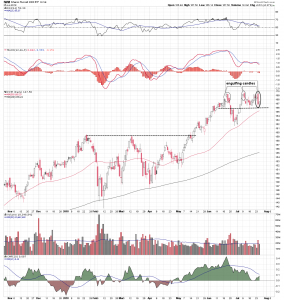 A pattern of bearish engulfing candles has formed on the iShares Russell 2000 ETF (IWM) daily chart, which could be an indication that the small-cap sector has made a intermediate term top. In June a bearish engulfing candle formed just below the $170 level. The pattern was repeated again in July and once more just last week. A bearish engulfing candle is one with a real body or opening and closing range, that engulfs or contains the previous day’s candle range. It is a dark colored candle whose close is lower than its open. In the case of last week’s candle, it engulfs nearly all of the previous week’s range. It is unusual to see three of these bearish two-day candle patterns form just below a common resistance level. One engulfing candle is considered a potentially bearish signal but three has the additional implication of a being a triple top. Moving average convergence/divergence and the relative strength indicator have been in slight bearish divergence to the recent sideways price action of the IWM. This reflects a loss in positive price momentum. The Chaikin money flow indicates a decline in positive money flow. A breakout above the $170 level, still a distinct possibility, negates the triple top thesis. A breakdown, however, below the rising 50 day moving average and horizontal support in the $166 area would imply an intermediate term top was in place.